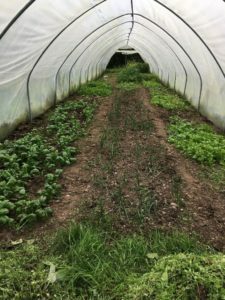 For a city girl with little experience in the countryside, to volunteer on an organic farm is a novel adventure. But when I woke up one day with the vision of doing just that, I knew that it was meant to be. And what an inspiring experience it was! Conscious living really does not have to be a far-fetched notion, it can start any time with a closer look at the choices we make every day. Soon after my arrival a member of the farm quietly introduced himself by snuggling up between my legs - rather intimate, I thought! I was never a pet person really but my heart was melted as soon as the initial surprise had passed. Most dogs I encountered greeted me with suspicion and took a while to accept my presence. Lucky however immediately assumed I was a friend. As a rescued dog, he came to the farm wary of human interaction. Once experienced love and care from people on the farm, he however assumed goodness in everyone he saw. Not everyone returned the love, but Lucky treated every new person with the same hope for friendship. How happier life would be if we could look at strangers with such an open heart! When I sowed tiny little seeds or delicate seedlings, I could hardly believe that the rough, rocky soil in my hand could nurture these life forms into big, healthy plants. But it did, time after time. I had never realised how rich the earth was and how much was going on in that world which my eyes could not see. Eddy, my host, asked if I consciously chose organic food back in London. I said that I didn’t because I was not concerned about consuming chemicals which would get into me through other ways anyway. Neither did I ever attach importance to my own longevity. But I decided that I would start going organic for the soil. The use of chemicals overtime creates a bacterial imbalance that would eventually render the soil lifeless. On a large scale, that would be a travesty. Who are we to take away this life-giving power of mother Earth which has nurtured billions of life forms over billions of years? Caroline could make more money selling her products to elite consumers at much higher margins but she chose to stay with regular food markets where “ordinary” people shopped. It was a conscious choice, out of the belief that “everyone should be able to afford organic food”. What touched me the most was the couple’s incredible kindness to everyone. Their generosity was born less out of an abundance of wealth and more from an abundance of heart. Witnessing their kindness to myself and others, I was more convinced than ever that no matter what you have or have not, living the life you want is a choice available at any point in time. Creating a happier world starts with each one of us. And it starts with kindness - to animals, plants, people, every other beings on Earth as well as to ourselves. True abundance arises in your heart, not your wallet. Stay true to your values, share what you have, love fearlessly and happiness will come your way day after day, as is the case with my hosts in Ireland.